We at All Seasons Residential Assisted Living realize that entrusting the health and well-being of your elderly loved one to an assisted living home is no easy decision. You want to find a home that will provide them with exceptional care in a beautiful and pleasant setting. Most assisted living homes look and feel institutional and sterile - but not ours. Our assisted living home looks like the other homes that line our residential street. We opened our doors with the purpose of providing the best combination of professional care and a comfortable home environment for seniors in Orangevale. If you are seeking assisted living in Roseville or Orangevale, you can feel confident turning to All Seasons Residential Assisted Living! 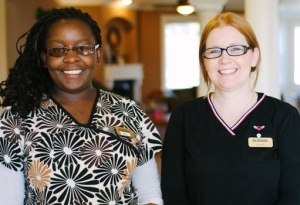 The services we offer at our Orangevale assisted living home are backed by many years of experience in the care industry. Our exceptional safety, care, and customer service have benefited countless residents, not to mention their families. We emphasize the importance of family communication and do what we can to create a safe and welcoming environment that makes it easy and encourages family members to visit their loved ones. Thanks to our small chain of command, we can minimize errors, which is what often plagues larger assisted living homes. In the event your loved one needs hospice care, our home can also assist you with that transition, right under our own roof. We extend our services to families in Granite Bay, Folsom, Fair Oaks, Carmichael, and Roseville. Interested In Our Care & Services? Call (916) 472-0811 Today To Request A Free Consultation & Community Tour! Contact our Orangevale Assisted Living Home Today At 916.472.0811! Our family-focused assisted living home welcomes you to seek more information about our caring and professional services. Let us help you take care of your loved one. At All Seasons, your loved one will be treated like family. Please contact us to learn more about how we can help you and your loved one make the transition into assisted care.